The Tucson region’s economic recovery is trying to stay in gear and gain traction but obstacles threatening it include an “economic cliff” coming Jan. 1 if Congress doesn’t come up with an alternative to the elimination of tax cuts and increased government spending. That was the message to about 450 who attended the University of Arizona’s Eller College of Management’s 2012 mid-year economic assessment Tuesday at the Westin La Paloma Resort and Spa, sponsored by JP Morgan Chase and Co.
Marshall J. Vest, director of the Eller College’s Economic and Business Research Center, said it was “personally disappointing” to report that the Tucson region hasn’t made headway in regaining the 35,000 jobs that were lost in the economic recession over the last four years. Statewide, Arizona has created 75,000 jobs since August 2010 and 69,400 of those have been in the Phoenix area. The Tucson region added just 800 jobs. And so many people have stopped looking for work that the labor participation rate is the lowest it has been in three decades. Vest said that creates an unknown for the economy recovery. If those who’ve dropped out try to return to the workforce and there aren’t enough new jobs for them, it will drive up unemployment rates. UA economics professor Gerald J. Swanson said he expects the unemployment rate to “yo-yo” up and down for a while. Swanson is an expert on global economics while Vest focuses on regional economics. Swanson said he was particularly taken by the disparity in unemployment among people who had reached different educational levels. Only 45.2 percent of people between 16 and 65 with less than a high school education are in the U.S. workforce and 39.8 percent are employed. Among people with a bachelor’s degree or more, 76.2 percent are in the workforce and 73.2 percent are employed. So while the national unemployment now stands 8.2 percent, the rate for people without a high-school diploma is 11.9 percent and just 3.9 percent among those who have a college degree. Swanson said he fears Washington, D.C., politicians are playing a game of chicken this year with either side waiting for the other to blink on the payroll tax cuts and Bush tax cuts that are due to expire at the end of the year when federal spending is due to increase. He asked the audience if anyone felt Congress was preparing to address the issue. “I don’t see it either,” he said, shaking his head. “There’s not a single forecast out there that says things will get better (if Congress doesn’t act),” he added. Additionally, mudslinging among candidates is also hurting the economic recovery because it doesn’t instill confidence in consumers, Swanson said. 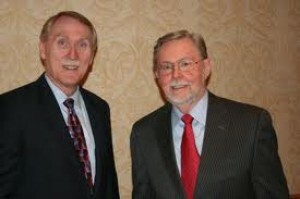 In keeping with his projection issued at the end of 2011, Vest said he anticipates the Tucson region’s economic recovery will continue but at a historically slow pace due to tight credit, reduced mobility for more people to move in to the region, lack of consumer confidence and a continuing drag from the public sector. It will take at least until 2015 before the damage from the recession is repaired. The Tucson region’s population is now at about 991,000, still under the 1 million mark, but after two years of declining it is starting to show some growth and will be back pacing at about 1.8 percent annually by 2015 and 2016. Arizona’s birth rate has fallen dramatically in the last five years and is now stabilizing at about 82,000 a year, where it was 12 years ago. Most of the decline is among Hispanics. The housing market is starting to show some upward growth as investors are coming back to buy. “The feeling is prices are at the bottom and they better get back in before the train leaves the station,” Vest said. Home prices in the Tucson market are up 15 percent over the past six months, according to the Tucson Association Realtors’ Multiple Listing Service but the Federal Housing Finance Agency shows that sales of existing homes is still declining. Inventory of homes on the market has fallen dramatically over the last year to about a 4-month supply, which Vest described as at the high end of normal. Retail sales grew by 7.3 percent last year, the highest since 2005 when there was a 9.2 percent gain. In February alone, retail sales were up 14.4 percent over February 2011. Retail sales growth is projected to slow this year to 4.9 percent as pent-up demand is satisfied. Restaurant and bar sales are projected to jump 5.1 percent this year, after increasing 3.8 percent in 2011. Contact reporter David Hatfield at [email protected] or (520) 295-4237.